Construction management and design buildservices for streetscape and public space beautification projects. Building code, compliance, CEI, engineering, GIS, landscape architecture, planning, project management, survey/mapping, traffic engineering. A professional, infrastructure and environmental services company delivering sustainable solutions around the world. Civil and environmental engineering, planning, landscape architecture, GIS, CEI. Statewide association focusing on the redevelopment of brownfields. Providing flexible financing and staff expertise to help projects succeed and improve low-income communities. United voice for Florida’s municipal governments. Administrator of insurance, investment, pension, loan and equipment financing programs. Nationwideleader of service to local government. 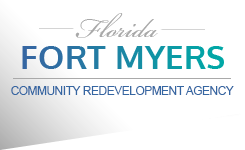 Bringing new direction, energy andlife to the City of Fort Myers redevelopment areas. A unique educational program designed to promote a prerequisite level of knowledge and professionalism in the field of community redevelopment. The courses are open to anyone interested in learning more about redevelopment practice in Florida. GAI’s Community Solutions Group is an idea-driven strategic consulting practice integrating design, planning and economics. Engineering, planning, landscape architectural, environmental, visioning and grand funding professionals for Florida communities. Legal services: redevelopment, environmental, land use, permitting, zoning, real estate. Playgrounds, shelter, shade and site furnishings, design and build. Public relations, marketing, digital media andweb design. Full serviceeconomic development, planning, redevelopment firm providing staffing and consulting. S&ME is an interdisciplinary firm offering planning, design, transportation, engineering andlandscape architecture. Community planning, development and redevelopment consultants. Offering a full range of retail, small business andcommercial products and services. Terracon is an employee-owned engineering firm providing environmental, facilities, geotechnical and material services. Transit, transportation, public finance and community planning + design solutions. Underground and above ground waste management system.